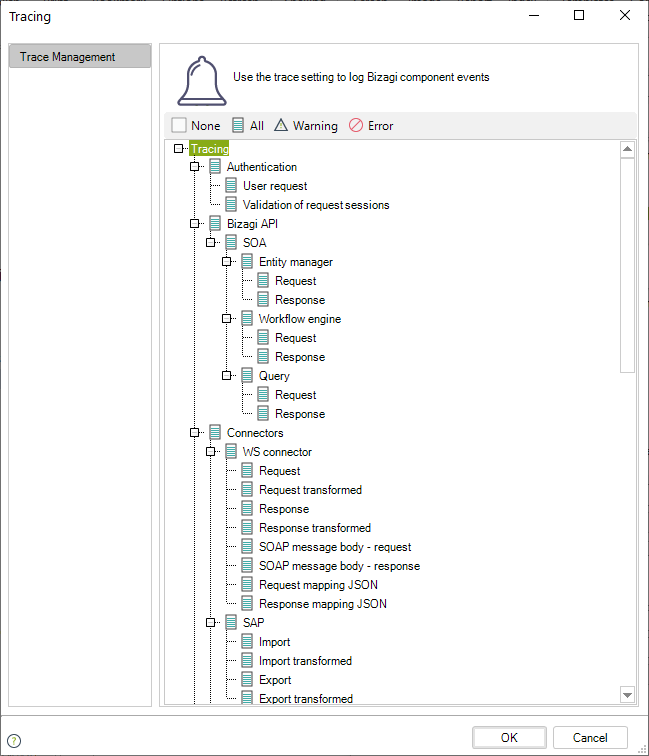 When configuring Web service invocations in Bizagi, you may rely on several features for error control and diagnostics. One of these features is the use of Traces whenever you detect there is an issue with the Web service invocation, and you wish to retrieve further detail. Whenever you are debugging a Web service invocation (in Development environments) or whenever you wish to retrieve further detail about a failed invocation, you may choose to turn on the WS Connector traces. Keep in mind that Interfaces traces can be enabled anytime, but it is strongly recommended to enable them temporarily only when needed (and afterwards, to disable them). Changes in this configuration will most likely require a reset in your Bizagi server's services. Enabling these traces is useful to track down, after an error in the application, the exact point where said error has happened. There are 6 points where detail is logged and you may diagnose if there is a problem at your Web service (target's invocation), or whenever transformations were being applied to the information. The following traces are logged with a chronological order, as detailed in the table below. 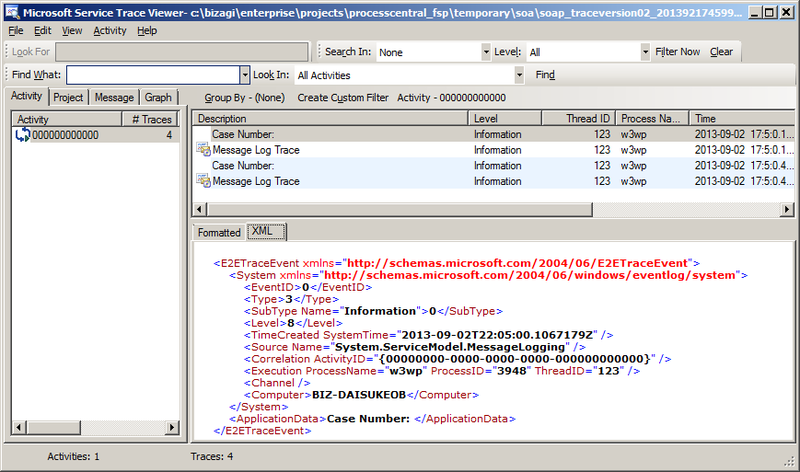 Leaves an XML-structured log with the business information retrieved from Bizagi. Note that timestamp is set as yyyyMMddHHmm. Leaves an XML-structured log with the result of an applied transformation (either a custom XSLT or by means of the out-of-the-box mapping functions), to the business information retrieved from Bizagi. Applies for invocations to SOAP Web services (RESTful services not included). In earlier Bizagi versions, it logs the XML body content of the information just as it is sent to the external system and without the SOAP header information. Leaves information in a log with details regarding the invocation, specifically considering information received from the response. In earlier Bizagi versions, it logs the XML body content of the information just as it is received from the external system and without the information contained in the SOAP header. Leaves an XML-structured log with the returned business information, just as returned by the web service. Leaves an XML-structured log with the result of an applied transformation (either a custom XSLT or by means of the out-of-the-box mapping functions), to the business information returned by the web service. In addition to the above, 2 additional traces are presented as an aid to verify how the inputs and outputs were mapped when configuring the integration. Useful namely on production environments, as it is the immediate way to verify how the mapping was configured. Leaves a JSON-structured log with information of how the mapping is done for the input parameters (including any transformation functions). Leaves a JSON-structured log with information of how the mapping is done for the output parameters (involving transformation functions). It is strongly recommended that you also define the service's expected time, so that you can explicitly assign both: a timeout for the service, and a logging threshold. •The logging threshold parameter for interfaces leaves a log to alert you about those interfaces whose invocations are delaying more than expected (more than usual). In this way, you can perform early diagnostics on your Web service and any additional variables affecting its performance. •The timeout thrown in a service invocation is due to the service delaying more than its timeout definition. For a service invoked in an asynchronous activity, the timeout definition is taken from the minimum time set from either: the timeout property set for the asynchronous task, or the timeout property set for the specific interface (through interfaces administration in the systems module). How to trace your Web service? With the following steps, we will illustrate how to use the interface invocations trace to detect and diagnose issues in external Web services invocations. As a most common practice, you may find that your Web service is invoked from an Asynchronous Activity. 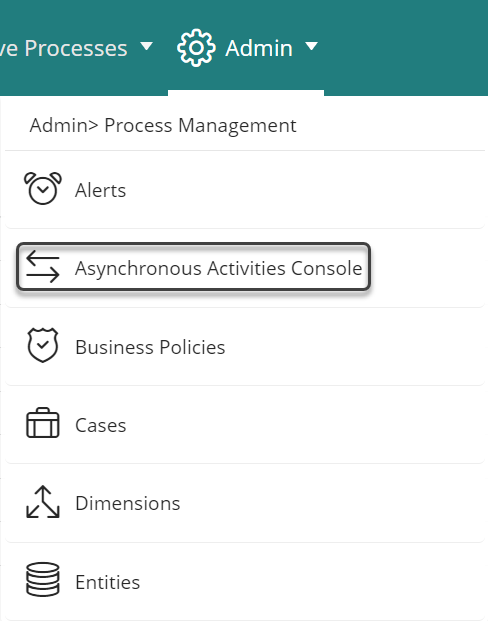 Should the invocation fail, further error detail can be viewed from the Admin menu, in the Asynchronous Activities console option. Through the Tracing options, enable all of the Interfaces traces. Retry the invocation of the interface to have a log with detail. Then, browse into your Bizagi Server and into the SOA interfaces traces folder (in this .NET example, this location would be C:\Bizagi\Projects\[project_name]\SOA). It is important to note that not for all cases, you could have all the files recorded. For example, if an error occurs in the extraction of data from Bizagi, then only the first file (Request mapping) will appear because the error occurred before the request was made. Validate information contained in these traces. If you find that all of the files are there, and the error seems to be when Bizagi calls upon the Web service, you may review the SOAP_TraceVersion02_[timestamp].svclog or send it to our support team. 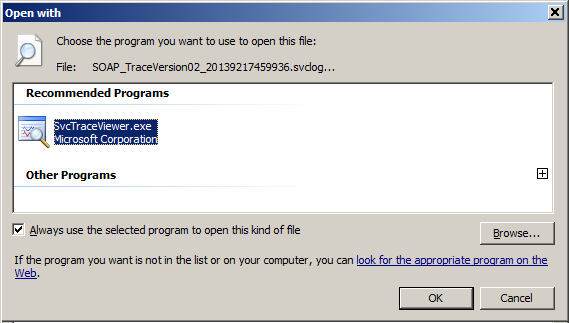 Note that this log can be viewed with the SvcTraceViewer provided by Microsoft within its 4.0 .NET framework.